Okra is full of valuable nutrients, nearly half of which is soluble fiber in the form of gums and pectins. Soluble fiber helps to lower serum cholesterol, reducing the risk of heart disease. The other half is insoluble fiber which helps to keep the intestinal tract healthy, thus decreasing the risk of some forms of cancer, especially colon cancer. Okra is very common vegetable in Indian diet, has several recipes from different regions of India. I think, in which way you cook this vege, it'll taste great, That's why, I love this vegetable so much. 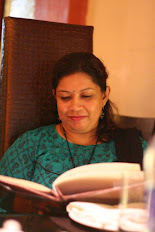 This recipe I found in one Indian cookbook by Mridula Baljekar, one England based Chef and cookbook writer, I want to share this recipe with you today...it is something very different and delicious. This is an onion-garlic free recipe as many people in India do not use onion and garlic during religious festivals. But you won't miss those ingredients in this recipe..try out sometime..........I added few ingredients, like tomatoes in the recipe and potatoes with okra. 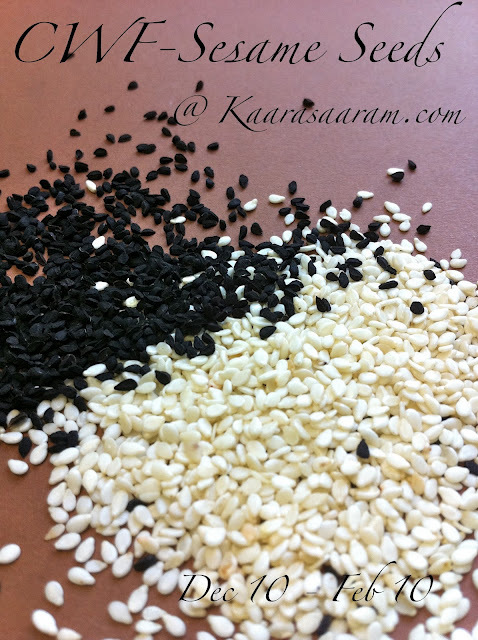 Black mustard seeds : 1/2 tsp. White poppy seeds : 1 tblsp. Dessicated coconut : 2 tblsp. Preperation: 1) Heat a non-stick tawa/griddle over medium heat and dry-roast sesame and poppy seeds, stirring constantly, until they are a shade darker. Transfer them to a plate and return the pan on heat. Add the dry chilli(broken up in 2) and coconut and roast them, until coconut turns a light-brown colour and dry chillies turn dark. Transfer them to another plate and let them cool. 2)When cool, using a coffee mill, grind all the roasted ingredients together until smooth. Keep aside. 3) Wash the okras, top and tail them and cut them each into 2-3 pieces(about 1") depending on their size. If using potatoes, cut them lengthwise in 1/2" thick pieces. Cooking : Heat oil in a heavy bottomed pan, add mustard seeds. As soon as they begin to pop, add cumin seeds. Follow with the okra, potatoes and little salt. Stir-fry for 2 min. and add chopped tomatoes. Stir for another 1-2 minutes. At this moment, add 1/2 cup of water, reduce the heat and close the lid. Cook for 6-7 minutes or until they are cooked. Stir the roasted ground spices into the okra and potatoes until they are fully coated with them. Stir fry for 2-3 minutes. Remove from the heat and serve as a side dish with plain rice or chapati or parantha. This is an awesome recipe ..I can get the taste right now. Hope will get some time to cook before I leave . 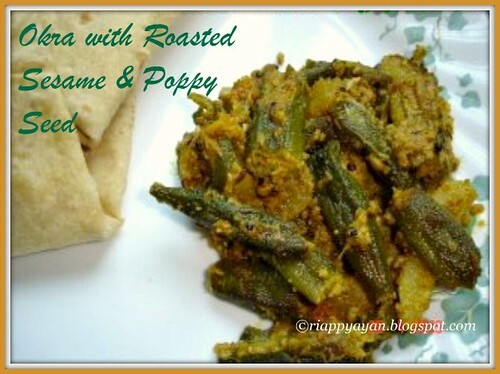 Delicious combinatin with okra with poppy seeds. Amazing preparation. This is very new way to make Orkra for me... I'd love to try it. This is very delicious, I made it first time and everyone liked it . thank you.